UPDATED JULY 12, 2017: Anti-choking device inventor claimed the president of Turkey relies on his invention -- but the product's Turkish distributor says that's "completely lies and fictions...we condemn this ugly news"
Last week I reported If the U.S. President has a choking emergency, will he be treated with this anti-choking plunger? about this page I found on the website of Dechoker Spain, based in Madrid. 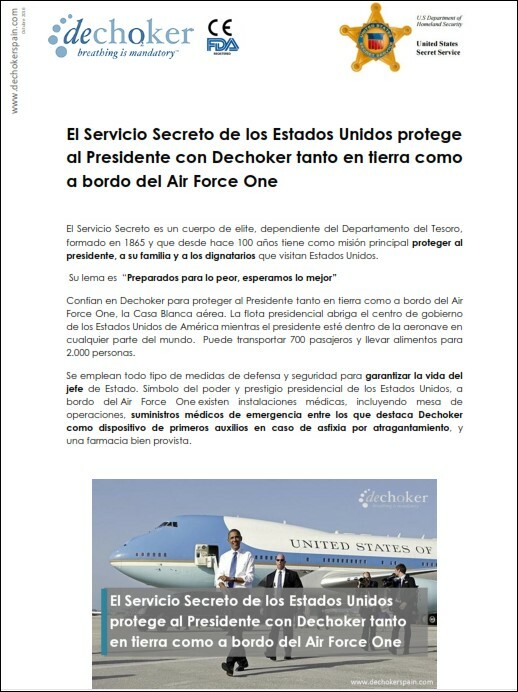 According to Google Translate, here's the headline in English: The Secret Service of the United States protects The President with Dechoker both on land and aboard Air Force One. The identical text is on the photo of President Barack Obama next to Air Force One. On the top right corner is the badge logo of the U.S. Secret Service. When it comes to accurate reporting, journalists would do well to heed this advice from President Ronald Reagan: Trust, but verify. And who better to verify than Alan Carver, inventor of the device and CEO of Dechoker LLC in Concord, NC, near Charlotte? In response to my inquiry, here's what I received from him yesterday. If any members of the security force of Turkey's brutal president Recep Tayyip Erdoğan are reading this, if you're not busy instigating bloody brawls with peaceful protesters, here's a training video featuring Mr. Carver.